In the blood, mucous membranes and lymphoid organs, dendritic cells provide a dual role as sentinels, but also as conductors of the immune orchestra. In the sequence of events that they are part of, the team of Philippe Pierre is particularly interested in the key stage of maturation of dendritic cells. 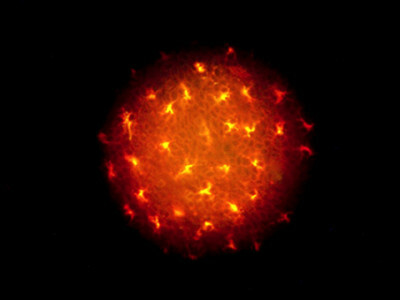 This is the moment when the cells detect the microbes, change their biological functions and begin their migration to secondary lymphoid organs. Dendritic cells (DCs) have the unique capacity to initiate primary immune responses by stimulating naive T cells. Philippe Pierre’s research focuses on gaining fundamental knowledge of their biology in normal and pathogenic conditions. He and his lab are interested in the fundamental changes occurring during the activation of DCs by pathogens (maturation) and how these biochemical events might contribute to chronic inflammation or autoimmunity. 2/ Invention and dissemination of a novel non-radioactive technology to monitor protein synthesis. (reviewed in Goodman et al, PNAS. 2012) and demonstration of the existence of nuclear protein synthesis (David et al. JCB 2012). 6/ Design of the biochemical pathway analysis software “Voronto” with R Santamaria (U. Salamenca, SP). (Santamaría and Pierre, Bioinformatics 2012). 7/ Participation to define the role of eIF2a kinases in brain function and cognition with Eric Klann (NYU, USA). Philippe Pierre’s aim is to elucidate the molecular mechanisms by which DCs control antigen processing and cytokine production, particularly during pathogen detection. He and his lab have been focusing on protein translation and quality control and their relationship to autophagy and MHC restricted antigen presentation. They are also searching for molecules regulating membrane traffic in conventional DCs and Interferon producing cells (plasmacytoid DCs), thus likely to also control the exogenous antigen processing and presentation capability of these cells. The Pierre laboratory is specialized in interdisciplinary approaches using cell biological techniques and bio-imaging tools to try to meet the challenge of understanding the massive molecular changes occurring during DC activation. Dendritic cells have the unique capacity to initiate primary immune responses by stimulating naive T cells. Through the targeted characterization of biochemical events, which, when defective, contribute to chronic inflammation or autoimmunity, Philippe Pierre’s laboratory has endeavoured the functional dissection of DCs maturation, providing new insights to how a complex immune response could be potentially modulated for therapeutic purposes. Protein synthesis inhibition and GADD34 control IFN-beta heterogeneous expression in response to dsRNA. Sept 2015, J Cell Biol.